Red Sandalwood is a small to medium sized deciduous tree, belonging to the Papilionaceae family. It has bark is redish-brown that exudes a deep red juice when cut, and bears spikes of yellow flowers. Red Sandalwood Powder produces a warm, sweet, woody fragrance that is a great addition to incense. It is mentioned in Sanskrit and Chinese manuscripts going back thousands of years. Red Sandalwood was t raditionally used as a diuretic, anti-diarrhea and stomachic but in modern times it is used as a natural dye to color herbal mixtures and toothpaste and has become one of the most popular natural dyes used today. Red Chandan beads have a very pleasant and soothing natural aroma. 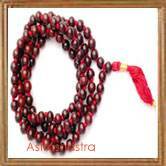 Red Chandan Mala has a very pleasant and soothing natural aroma. The beads unfold vibrant energy and gives strength, bravery and willpower to the wearer. Highly recommended for students, this Red Sandalwood mala gives control over the senses and energizes the body. Lal Chandan mala brings awareness to the super consciousness, improves concentration and mental arrangement. Wearing of this mala brings about the renunciation from worldly affairs. The wearer enjoys all luxuries at his command, remaining himself unattached. The wearer attracts great wealth and prosperity. energizes/consecrates Lal Chandan Ki Mala with Vedic mantras, beautifully combining with some other potent verses, before being forwarded to you. It unfolds vibrant energy and gives bravery, strength and willpower. It is warming, improves circulation and protects from negative energy. It is also helpful for indigestion and cold. It attracts abundance and prosperity.